At GreenWave Solutions, we’re more than just interior and exterior Atlanta painters. We’re Atlanta home improvement specialists, Atlanta home re-modelers, and Atlanta commercial remodeling professionals. We offer products and services for almost every room on the inside of your home and every application on the outside. With satisfied customers throughout the Atlanta metro region, our work as an experienced Atlanta painting company is on display everyday – evident in the durability of many homes and buildings you pass by. Looking for a unique finish? GreenWave Solutions will use a variety of faux impressions from Sherwin-Williams and transform every room into an original. With Faux Impressions done by GreenWave Solutions from Sherwin-Williams product line, every room is an original art piece. Please select a faux style for more information. 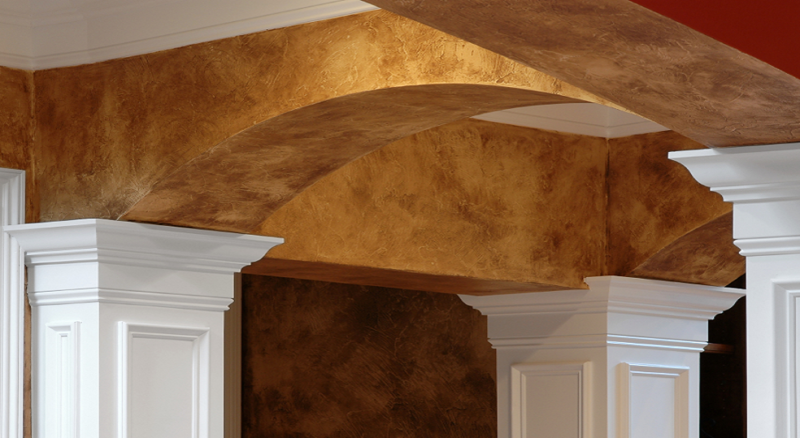 Inspired by plastering methods once used by master craftsmen in ancient Rome, Old World Impressions specialty finishes have a unique, handcrafted appearance that boasts incredible depth and dimension. GreenWave Solutions will choose from a host of natural, earthy color combinations created by the design experts at Sherwin-Williams to work as well in a contemporary home or Southwestern ranch as they would in a quaint, European château. GreenWave Solutions will mix timeless sophistication with a dash of glitz, and you’ll find the radiant collection of Metallic Impressions specialty finishes from Sherwin-Williams. Reflective pearlescence evokes the glamour and romance of the Hollywood silver screen creating an ultra cool and fabulously fresh look. Try one of the stunning jewel-tone color choices developed by our design team to add even more drama and richness. Quartz Stone Impressions specialty finishes offer a rich visual and tactile experience that is certain to create an eye-catching focal point in your home. The softly sparkling beauty of this collection evokes a look of semi-precious stones that tectonic activity has revealed among majestic plateaus and awe-inspiring canyon ridges. Glistening flecks are revealed as your eye follows light reflecting across the surface. Think of it as earthy meets exotic. No two applications of Artisan Impressions will be the same because GreenWave Solutions handcrafted touch transforms these finishes into a personal expression of your creativity. But don’t confuse handcrafted for rustic. All three techniques in this category can range from decorative and natural to casually elegant and sophisticated depending on color choice and placement within your space. For example, each one would make a splendid impact as a feature wall or focal point in a bold or contrasting color.